This beginner-level needle felting kit has everything you need to make charming, woolen hedgehogs. 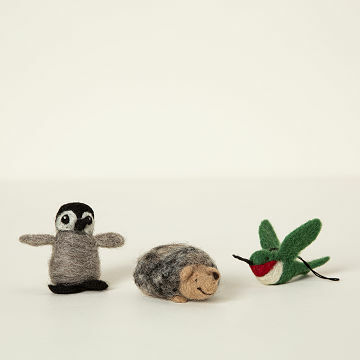 Have you ever wanted to learn the art of needle felting? Laurie Sharp might be the best person to teach you. This beginner-level felting kit is doubly wonderful. First, it comes with step-by-step instructions and all the supplies you need to create 2-3 charming felted hedgehogs. Then, when the project is completed, you have adorable new toys to play with or display. The tools, leftover wool and skills you have learned can all be reused when moving on to your next project. It's a great new hobby to enjoy or share, and makes a fun gift whether you're giving the kit or the wee creatures you've created. Assembled in Kent, WA with wool from New Zealand and felting needles from China. Laurie Sharp has a passion for creating things. As she grew older she dabbled in drawing, painting, wood sculpting, knitting, crocheting, photography and puppet making. In addition her passion for creating art, Laurie loved working with small children and became an accredited Waldorf kindergarten teacher. It was during her teacher training that she learned the fundamentals of dry felting, or needle felting, with wool. In 2001, Laurie Sharp started her own Waldorf inspired pre-school. Her curriculum included storytelling with puppet shows and she preferred to create her own puppets. Needle felting gave her the ability to create small characters and animals for storytelling and she would often send a few creations home with children. Eventually her pre-school parents started asking Laurie to make things for their children and encouraged her to teach them how to sculpt with wool. Laurie looked for needle felting kits to assist her learning and teaching and found there were not many instructional kits to be found. Her company was born in 2007 out of the passion to create and teach. The first kits were developed with her husband, Kevin Sharp, and contained wool from Laurie's own sheep, Hazel and Merna who have retired to greener pastures. Today Laurie and Kevin have thirty one needle felting kits in their nest (and counting) and have hatched three instructional needle felting books as well. Please note: this is a beginner-level kit. Kit makes 2 -3 3.25" L x 2" W hedgehogs, depending on the amount of felt used. I bought this as an early Christmas gift for myself. :) The instructions are clear and easy to follow (though my wool pets look a bit more like rats than hedgehogs). I'd never felted before, so this kitâ€”which included everythingâ€”was perfect. I broke both the needles on my first two pets, though, and had to purchase additional needles. Poke lightly! Love these little hedgehogs ! I bought as a project to make with my 10 year old granddaughter. I was delighted to find such an unusual item. Great for a Rainy Afternoon for Hedgehogaholics! My sister in law has always wanted a hedgehog named Cornelius. This kit is for her. I bought my neice, her daughter, several craft kits for Christmas including one for Mommy and me necklaces and thought "why not get Jaime a craft kit she can do while Kaitlyn is doing hers?". So I looked for craft kits involving hedgehogs and this came up. They're adorable! And I bet she names each one Cornelius. Now my sister can hopefully teach me! I bought this as a Christmas gift for my sister with a slightly ulterior motive. She is a very talented crafter and I have always wanted to learn how to do needle felting. However, I live in a crafting wasteland...no place to take classes, no place to purchase materials...it's a tourist town at the beach. So....she had mentioned how much she liked wool felt items too. The reviews said how easy the instructions were to follow and she is very talented. I figured she could learn how to do it and then teach me! I bought the hedgehog kit for my 15-year-old daughter for Christmas. She was delighted with the cute craft and anxious to start making it. I was pleased with the quality. Gave it to my 14 year old granddaughter on Christmas. She couldn't wait to start and made a darling hedgehog by the end of the day... She taught herself from the instructions, and is probably making the second one by now. It started her on a whole new craft! I bought this to make gifts for christmas. I love that I can make the hedgehog my own and the directions were very easy to follow.